Left photo above is the main entrance gate to Fort de Chartres. The middle photo is of the Black Powder storage building located within the fort and the photo on the right is a full view of Fort de Chartres with the ghosting outline of the Government House outside the fort. Photos taken in 2010 by Francois Saucier's descendant Sandra Bates. ​For almost a century, beginning in 1673 when Louis Joliet and Jacques Marquette explored the Mississippi River, France claimed the Illinois Country. In 1718 the French reorganized the administration of their American possessions and territory, removing the Illinois Country from Canadian jurisdiction and then made it part of the Louisiana Territory. The Government of this vast territory was located in New Orleans and its control was turned over to the Company of the Indies. The Company of the Indies was a commercial enterprise chartered by King Louis XV of France to govern and over see the territory. In December of 1718 a contingent of soldiers, officials and workmen were sent north to establish a civil government in the region. A wooden fort was soon constructed eighteen miles north of the village of Kaskaskia from which the civil authority would operate and whose military presence it was hoped would pacify the Fox Tribe. This wooden stockade was surrounded by a dry moat held several interior buildings including a storehouse and a counting house used by the Indies Company. 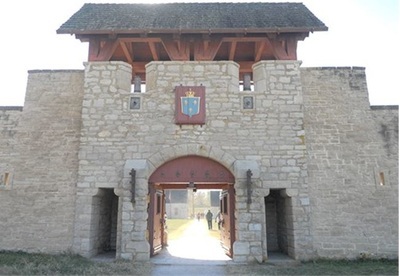 The stockade, named Fort de Chartres in honor of Louis duc de Chartres, son of the regent of France, quickly deteriorated due to frequent flooding. Work on a larger fort, located farther inland, began around 1725. By 1731 the Company of the Indies went out of business due to bad management, poor relations with the local Native Americans, and the failure to discover any gold or other precious metals. In January of 1731 the company returned control of Louisiana back to the king. In 1747, with the second fort in considerable disrepair, the garrison was relocated to nearby Kaskaskia. During the 1730's the French leaders began discussing building a stone fort to protect their interests in the region. Though no precious metals were found, profitable lead deposits had been found on the west bank of the Mississippi near Ste. Genevieve and the rich bottom lands yielded substantial crops which fed New Orleans, St. Louis, and the rest of the territory. Construction of the new fort was slow due to dissension on where the fort was to be located, as well as to the estimated high cost of building the fort as originally laid out by Francois. Eventually the French government approved a smaller fort, costing less, to be constructed and new revised plans were submitted to Francois. It would still turn out to be the most expensive fort to ever be built by France. ​Construction of the new stone fort finally began by engineer Francois Saucier and his crews in 1751. Construction was difficult. The lack of experienced workers and the many desertions, along with the extreme cold weather, slowed the work effort. Soldiers from the local garrison were used to supplement the civilian work force. Furthermore, construction material had to be brought in from north of Prairie du Rocher, located about two miles from the construction site. The cost of construction, evaluated at some five million livres, according to some estimates (about twenty million in today's dollars), rapidly escalated to the point where the French crown threatened to abandon the work which was well in progress. The new governor of New Orleans, Louis Billouard de Kerlerec, assured the French minister that construction was nearly complete. Although the fort was operational by 1756, new additions and additional improvements continued until 1760. The construction of Fort de Chartres had taken its toll on Francois' health. Francois Saucier died in 1757 with only a small amount of work remaining to be completed. In 1763 France surrendered the Illinois Country along with most of its North American possessions to Great Britain when it signed the Treaty of Paris that ended the Seven Years War. British troops of the 42nd Royal Highland Regiment took possession of Fort de Chartres on October 10, 1765. The British did little with the newly renamed Fort Cavendish although its engineers attempted in vain to control the erosion caused by the Mississippi. Eventually the British concluded that the fort had little value and it was abandoned in 1771. A year later the south wall and bastions collapsed into the Mississippi River. Continued flooding, erosion and decay caused the fort to slowly disappear so that by 1900 the only remnant of the fort that existed above ground was the powder magazine considered by many to be the oldest building in Illinois. In 1913 the Illinois legislature authorized the purchase of the stone fort site and the powder magazine was restored in about 1917. In the 1920's portions of the building and wall foundations were exposed, and in the 1930's the Works Progress Administration reconstructed the gateway and two stone buildings. Today visitors will find a partially rebuilt eighteenth-century stone fort originally constructed by Francois Saucier in 1756. 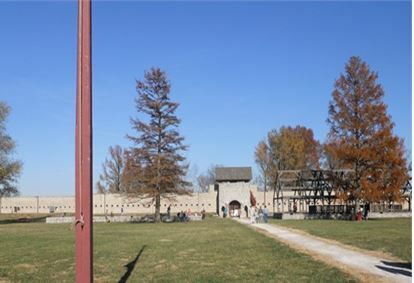 The north wall contains bastions, a gatehouse, musket ports, embrasures for cannon, and the restored powder magazine. 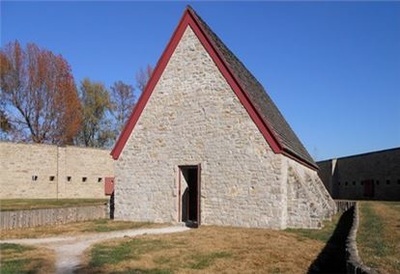 The King's Storehouse is home to the Piethman Museum which uses items discovered during archaeological research near the fort, other artifacts, and exhibits to interpret life in Illinois during the colonial period. The East Barracks and the Government House have been outlined by wood frames, a technique called ghosting, to provide a sense of their original size and form.